The Greatest Gift to Remember a Wonderful Life – Write with us! I’m excited about Christmas. And not just because of Small Business Saturday. (Although remember every day is Small Business Saturday, so always think of shopping small.) But I’m excited because of all the messages around me as a reminder for the reason for the season. Marsha English brought in her artwork to display in TT Patton. For twelve days, December 12-24, you are your family are invited to explore, discover and walk through twelve stores in the Village of Barrington for the Christmas Artwalk. Twelve artists have created original pieces depicting the biblical story of Christmas. Each piece tells the story through the actions of the characters at the point of the story inspiring viewers to remember the true Gift of Christmas. We’re stop #4, A Decree of a Census, Luke 2:1-3. Supported by the many churches in the Barrington area, we hope you enjoy this creative journey. Not even the Saturday Evening Post would publish it in 1943. So he made it into a Christmas card and mailed to friends and family. 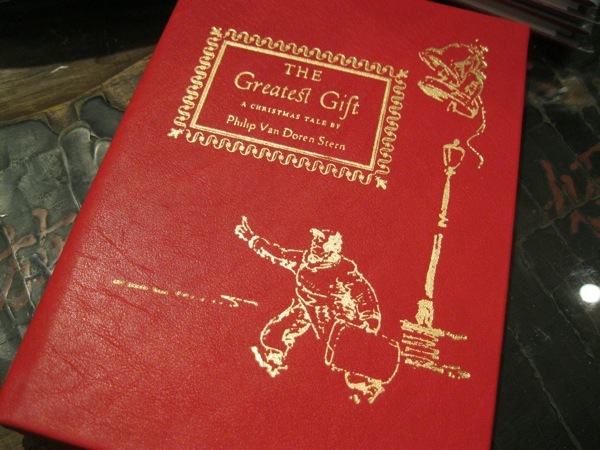 But when received by a well-known studio, Philip Van Doren Stern sold the movie rights of his book The Greatest Gift in 1944 for $50,000. And in December 1946, It’s a Wonderful Life was released in the theater. We all know the plot…a story about a man who thought he was a failure and who was given the opportunity to come back and see the world as it would have been had he not been born. Well, the book has been republished in a beautiful calfskin leather cover by Graphic Image with the same images from the original Christmas card. The book sells for $50 at TT Patton, looks nice personalized and makes “the greatest gift”. Yes we watch it every year. But have you ever seen it on the big screen? Well, thanks to Community Church of Barrington, Zina Jacque and Art Rice for sponsoring the Classic Christmas Matinee – IT’S A WONDERFUL LIFE – starring Jimmy Stewart, Donna Reed & Lionel Barrymore. It’s showing at The Catlow only on Saturday December 14th at 11:00 AM. Tickets go on sale for $5 at 10:00 AM, an hour before the show starts. No advanced ticket sales. And the weekend doesn’t end with the movie. 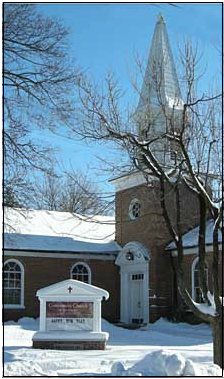 Join The Community Church Barrington on Sunday December 15th at 10:30am when the pastor Rev. Dr. Zina Jacque will base her sermon on the movie…a treat you will want to hear! The Community Church of Barrington has been serving the Barrington area for over 160 years and is located at 407 South Grove Avenue, at the corner of Lincoln and Grove Avenues. See why I’m excited about Christmas? It’s a season to remember the greatest gift and to always be grateful for this wonderful life.